Seventeen people have been sickened in four states — with one fatal case in New York — from a salmonella outbreak tied to raw chicken, according to the Centers of Disease Control and Prevention (CDC). In a news release posted Wednesday, CDC officials said that eight people had been hospitalized. The states identified in addition to New York were Maryland, Pennsylvania and Virginia. New York had the most reported cases: 11. The illnesses were reported from Sept. 25 to June 4, CDC officials said, and victims ranged in age from less than a year old to 76. 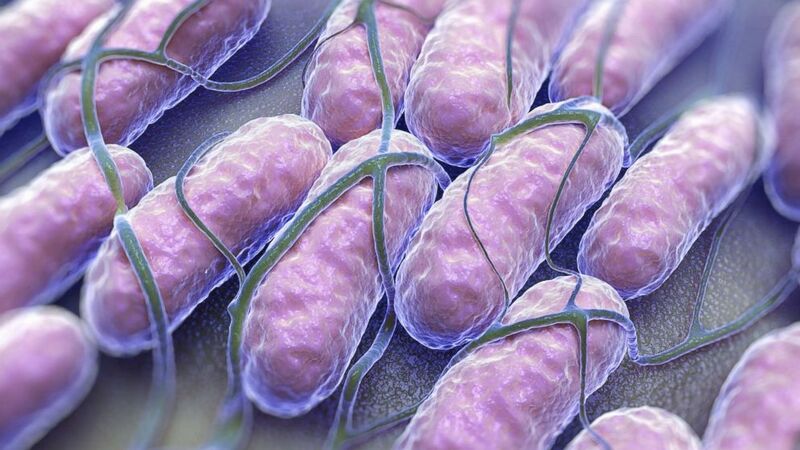 A culture of Salmonella bacteria is pictured in this undated stock photo. The outbreak strain was also identified in samples of raw chicken collected from two facilities, including one facility that processes Empire Kosher brand chicken. CDC officials said that “epidemiologic and traceback evidence” indicated that some kosher chicken products had been contaminated with salmonella. In interviews that CDC experts conducted with the victims, those who had fallen ill reported eating chicken products prior to getting sick, according to the agency. Of the nine people who had provided brand information about the chicken products, seven specifically named the Empire Kosher brand. “The outbreak strain was also identified in samples of raw chicken collected from two facilities, including one facility that processes Empire Kosher brand chicken,” CDC officials said. On Friday, the U.S. Department of Agriculture and Empire Kosher Poultry Inc. issued a public health alert because of concerns about a salmonella outbreak. According to the joint release, Empire Kosher Poultry’s raw chicken items, “which may include raw whole chicken (and) raw chicken parts,” had been produced and sold to consumers from September 2017 to June 2018. According to the CDC, most people infected with salmonella develop diarrhea, fever and stomach cramps 12 to 72 hours after being exposed to the bacteria. The illness usually lasts four to seven days, and most people recover without treatment. In some people, hospitalization may be necessary. In rare cases, salmonella infection can cause death unless the person is treated promptly with antibiotics. Five Places to Go in Burien, Wash.
September 13, 2018 Comments Off on Five Places to Go in Burien, Wash.